So you've never made a cake before, you don't know how to bake you say, why make a cake when it's easier to buy one. Well people, this cake is for you, this is for those of you that have never made a cake before, for those of you that say you can't bake, well guess what, this one isn't baked. And bought cakes, sorry homemade is better, I can't go there. This cake is for everyone that likes a chocolate biscuit, bakers, non bakers, if you a love a chocolate biscuit, this cake is for you. My mum sent me this recipe to make for my nieces birthday. Happy Birthday Jessica, threw this in to see if she reads my blog. So as I always listen to mum, I'm scared not to, kidding, no really she can be scary, kidding, she's nice, but scary, I made it as requested. 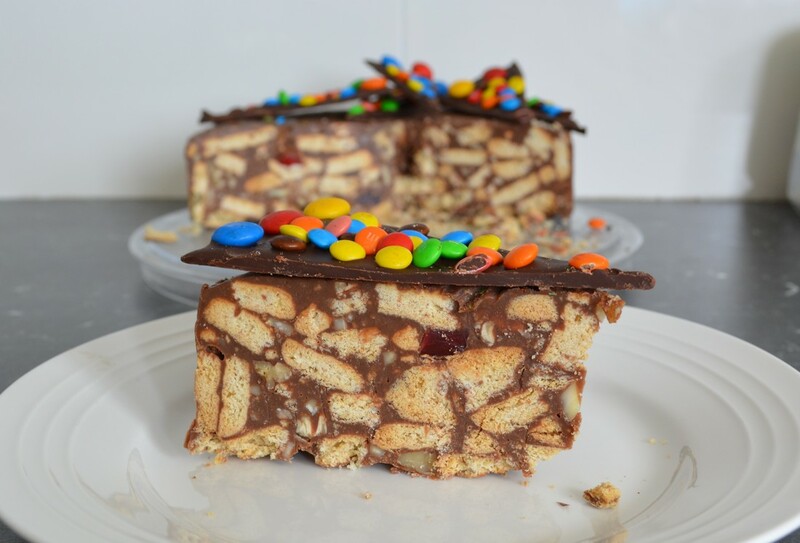 It is a cake that you break up some biscuits, mix it up with a few more chopped up treats, mix in some melted chocolate and a few other wet ingredients, press it into a pan and voila (I became French in the last second) you have a cake. I loved it, it was great, the texture brilliant, flavour, lovely. Now as I find with most chocolate desserts, a little goes a long way, slice it thinly, you want to enjoy every bite. Too big slices and it gets too much, especially since if you are at a party with my family, on party days, by the time the cake comes out, you've already eaten a weeks worth of food, so thin slices, enjoy it. Now I have changed a few of the ingredients. I omitted raisins, because I cannot stand them, you could add in 1/3 cup, if you like them. I can't stand glace cherries, horrible things (does anyone really even like them) so I replaced them with is 1/3 cup of chopped up red frog lollies. Oh yes I did, when you eat the cake, you know you found a red frog as it adds a chewy element, and adds a nice flavour. This is supposed to be Prince William's favourite cake. Wow, special moment for me, as now I know I am that good that I can cook for royalty. A cake I make is fit for a future king. Now I love digestive biscuits, probably my favourite biscuit, but you can use your favourite plain sweet biscuit in this cake to make it suit your tastes. 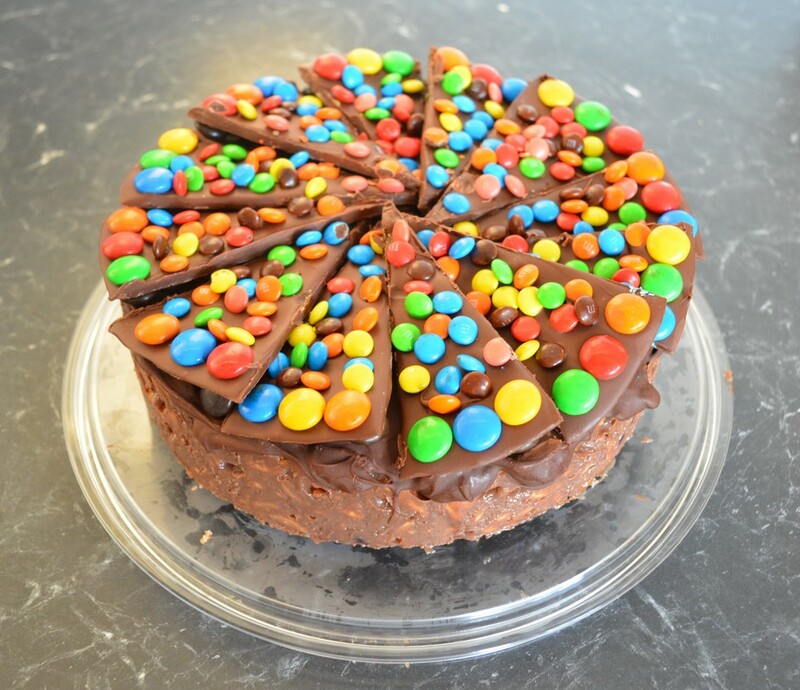 Now, the chocolate shards, go nuts with the flavours, I added M&M's, you can add coconut, to make chocolate rough shards, add nuts, chocolate chips, 100's and 1000's, what ever you love, put it on. You can place the chocolate shards on the cake while the cake chocolate is still 'wet' that makes the shards stick to the cake, but I find that makes slicing the cake difficult. So I like to allow the chocolate on the cake to set first, then decorate with shards. That way I can move the shards when slicing. This cake keeps well to, leftovers are perfectly good up to a week later, it hasn't lasted longer than that, so I can't tell you if it lasts any longer. 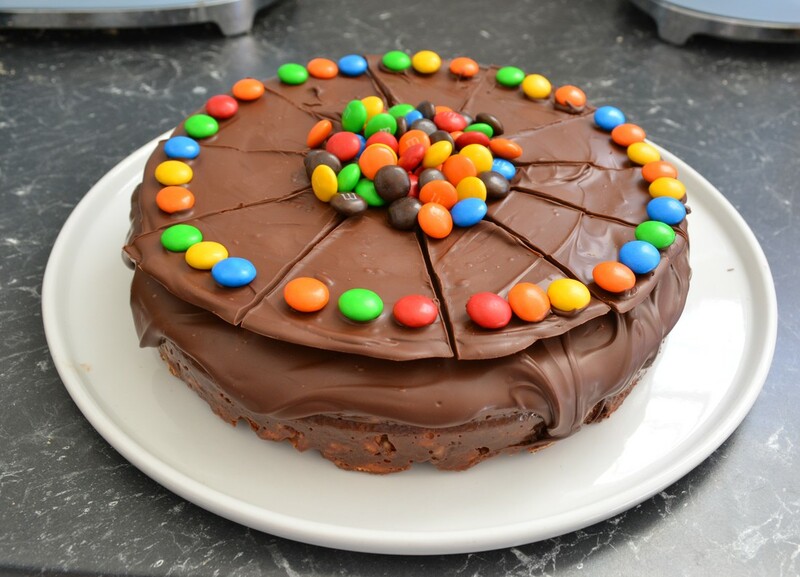 I am in a bit of a silly mood, but in all seriousness, this is a good cake and you should make it, it is fun, it is tasty and with so little effort, it looks good. Grease with cooking spray a 20cm round springform tin. Line base and side with baking paper. Roughly crush biscuits into a large bowl. Stir in red frogs, pecans and almonds. Place butter, condensed milk and 150g of the chocolate in a medium saucepan. Stir over a low to medium heat until melted and smooth. Stir into biscuit mixture until well coated. Spoon into prepared pan. Press down gently to smooth over the top. Make the Chocolate Shards: Trace a 20cm circle on a piece of baking paper, place pencil side down on a flat tray. Melt the chocolate and spread evenly in the circle. Stand at room temperature until set. Just before it sets, and the chocolate is still a little wet and still sticky, I like to score the wedges, this makes it easier to cut later, the chocolate is less likely to crack when cutting. Also if decorating, I add on the m&m's as they now still stick to the chocolate, try and keep inside your wedge lines when decorating. Allow to set completely. Use a sharp knife to cut the chocolate into wedges. Place in a container, until needed. The next day, remove cake from the refrigerator, remove base and sides and place on a serving plate. Place remaining 150g chocolate in a heatproof bowl. Place bowl over a saucepan of simmering water and stir chocolate until melted. Cool slightly. Spread melted chocolate over the top of the cake. Refrigerate until set. Decorate with Chocolate Shards. Serve. Decorate the chocolate shards, however you like.